Good item, well made and quick charging. a very good product,seems better value than my old c-tek that i had been using,also exellent prompt delivery,definitely buy from them again. Good quality product. Sturdy housing and strong clips. Fan can be a little noisy, but only comes on when the unit gets quite warm. Outstanding battery charger. I flattened the battery to my classic wonder car by not disconnecting in time and allowing it to deeply discharge. My own fault and not the first time either. Normal battery charger with re-conditioner could not move voltage above 4v. I tried the Powerline 7A charger on the basis that I needed a new charger anyway. I was amazed when my discharged battery was genuinely reconditioned and at full charge within 10 hrs. Joy. next I thought I would try out my new charger on old, deeply discharged battery ,standing for 2 years. That was a challenge. WITHIN 10 hrs. my deeply discharged battery was reconditioned and fully charged and retaining charge. Fabulous is an understatement. This is true love. BUY one NOW. Ps ..the service was as good as the charger. Good product for the price, does everything I needed, excellent service. Ideal for charging leisure battery for electric fence . 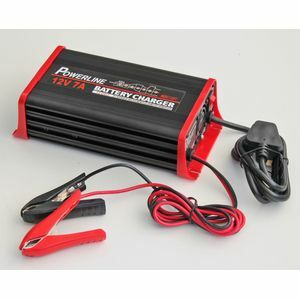 Excellent service, agreat product and speedy delivry recommended..
Only used the powerline charger once up to now and it did everything as was described, i am well pleased with this product. Comprehensive spec and good price. Comprehensive,careful charger for our leisure battery. Very pleased that we know it's been looked after!!! Charger seems robust and works well. Fitted to camper van to charge leisure battery while connected to mains supply.